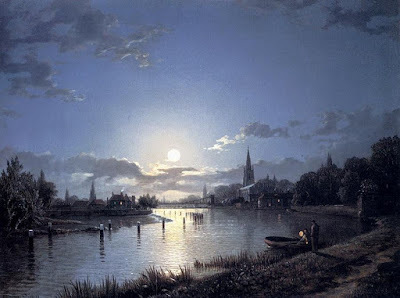 Henry Pether (1828-1865) did a large number of paintings by moonlight, including some scenes where the same location was painted by day and by night. The subject of his dozens of paintings in moonlight were usually recognizable landmarks, almost evenly split between London and Venice. The silhouettes of well-known structures lends more of a story to the images than there would be if were a simple river scene by moonlight (a few of which he did). By and large, though, the works are identified by location, and have a intriguing air about them: without any other persons out at these hours, the viewer is left to imagine their own participation in the enchanting atmosphere.